Kauri Gum is the fossilised resin or sap of the Kauri Tree. These enormous trees produce vast amounts of sap which congeal into lumps when the tree is injured. The sap hardens into a resin and becomes a form of Copal. Kauri Gum comes in many shades and colours, from almost completely clear up to almost black. Dark Red and Green pieces are occasionally located. Kauri gum will eventually harden to a point where it is fully fossilised and is more accurately described as Amber. Some Kauri Gum found in the Otago in the South Island has been estimated by scientists to be over 175 million years old. Most of the Kauri Gum found on the Gumdiggers Park site is around 100,000 years old. The debate over the classification of Kauri Gum has gone on for many years. Kauri Gum is sometimes known as New Zealand Amber. However there is disagreement amongst geologists and no absolute rule applies although the New Zealand Rock Hound Society is trying to establish a firm classification. However, in general, young gum that is not fossilised is known as Kauri Gum. It is readily melted and is not able to be polished to a high shine. Often it is "milky" or "cloudy" and a thumb nail can be pressed into the gum, leaving a mark on the surface. The outside surface also "crazes" (develops fine cracks) quickly so is not really suitable for making quality Jewellery. 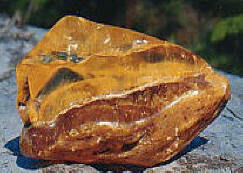 In earlier times it was often melted and had "inclusions" placed inside and passed off as Amber. Kauri Gum which has aged to the stage of being sub-fossilised is properly known as Kauri Copal, Copal being derived from the Spanish word “copalli” meaning incense. Other types of copal are usually used for this purpose (frankincense is probably the most well known) but Kauri Copal has a distinctive and pleasant smell. It is more durable that Kauri Gum and is easier to polish and the shine will last on the surface for longer. 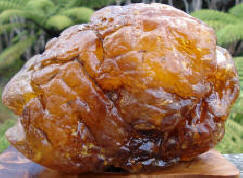 Kauri Copal is often referred to as a "sub-fossilised resin". It can be many hundreds of thousands of years old. Most of the pieces seen today fall into this "Copal" category. Unfortunately there is a huge variation in the characteristics of individual pieces of the Kauri Copal. Only the older, harder forms are really suitable for making into jewellery or carving. It is almost impossible to determine this by non-destructive methods. There are other tests available but they involve the use of scientific measuring equipment not normally accessible to most people. "New Zealand Amber" is older and harder again than Kauri Copal and is fairly rare. 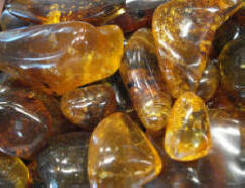 Some of it is millions of years old and passes all the test for Amber. It has undergone the process of polymerisation where the chemical structure has changed and the gum is fully fossilised. It polishes to a high shine and is a true gemstone. A common test for Copal versus amber is to place a small drop of ether on the surface (or other form of alcohol, nail polish remover will do). Amber will not be affected whilst Copal will turn sticky. Another test needs only an open flame; Copal melts when placed next to a hot flame whereas Amber will become discoloured and turn sticky but stay intact. Perhaps whether it is classed as NZ Amber or Copal is unimportant. Baltic Amber is still being mined today and the mines are estimated to last another 300 years. 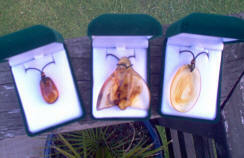 Kauri Gum/Copal/Amber is much rarer, no new supplies are available and very little remains outside of museums. It comes in a huge variety of colours and patterns and no two pieces are the same. Prices for the individual pieces and jewellery are rising rapidly.